Back when I used to have an office job I was called the poop queen. I am sure you can imagine all kinds of scenarios that would lead to that nickname but I assure you the real reason is far less amusing. I was a Water Quality Specialist in charge of making sure the lake, stream and ocean water in our community stayed clean (or at least making sure it didn’t get any worse). In my 10-year career, I learned about all kinds of nasty and seemingly harmless things that could dirty our water. One of the biggest water quality issues is pet waste – or rather, not picking it up. I became the poop queen because I took it upon myself do research absolutely everything there was to know about dog poop disposal methods. In our area, the “best” way to dispose of pet waste is by picking it up in a poop bag and throwing it in the trash. The good news is that most dog owners in Eco-conscious Seattle have gotten the message. Unfortunately, some seem to have only gotten part of the message. 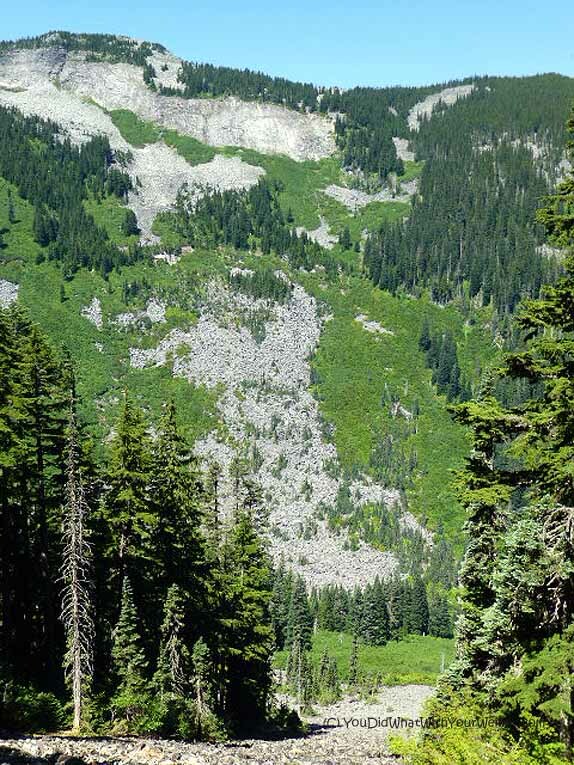 On our hike to Annette Lake last week, I found two poop bags laying on the side of the trail. It’s an all-too common occurrence. Now, I know what you may be thinking – Maybe people are setting them there so they don’t have to carry them and are going to pick them up on their way back down the trail. I am sure that some people do. However, I have seen orphaned trailside poop bags that look like they have seen a few days or weeks. Obviously, some of these bags have been forgotten. People aren’t getting the message that you absolutely cannot scoop poop on the trail and then leave it on the side of the trail. That is even worse for the environment that never picking it up at all! The message to hikers should be that you carry your full poop bags with you. Who wants to find a poop bag here? Not me. I bring a gallon Ziplock bag to put the poop bags and they seal in the stink. I don’t even know I am carrying them (PS…don’t forget to take them out of your pack when you are done. Take it from me, it’s not pretty if you do). If you carry them with you, there is no way you are going to forget to pick them up. On our hike to Lake Annette I made a pledge to myself. I know some people who pick up other people’s dog poop if they find it on the street. I have been known to do that sometimes too. This pledge I made is that I will carry an extra gallon Ziplock bag with me on hikes and pick up, and carry out, all abandoned poop bags that I find. That is going to be my contribution to preserving nature and protecting water quality. I want these things to be there forever and I don’t want dogs to be banned from hiking trails because of irresponsible pet parents. Would you pick up someone else’s dog poop? The only time we pick up other people’s poop is when their dogs go in our yard. 🙂 Luckily most people around here are considerate and pick it up. I don’t ever Let Chester and Gretel poop is someone else’s yard, even if I do pick it up. I walk with a friend who does though and it really irritates me. I don’t fell like it is my place to tell her not to do that though since she does pick it up right away. I may be wrong but I am guessing the trails we hike on are more crowded than yours. They can easily see 50 dogs (and owners) a day plus up to a couple hundred other people. With that kind of volume, it is inevitable that one or two dog owners will set down their bag and forget it. I know some set it down and pick it up on the way back but I don’t like seeing them because I never know if the people will remember them. Some have clearly been there for weeks or days. I REALLY don’t imagine non-dog owners like to see them on their hike even if they will be picked up. I don’t want dog owners to gt a bad name and not be allowed anymore. That is why I am vowing to pick them all up now. Bravo to you! I have picked up poop (others) because I share your love of the outdoors. That’s great Sue! As I said, I haven’t always picked up others dog poo in the City but I think I will start doing that more consistently too. I really like the idea of bringing along a zip-lock plastic bag to trap in the stinky! Must admit, we never pick up others poop along the way. Kudos to you for doing this! Unfortunately, on several of the trails near us, we’re still working on step 1 – picking it up. Some trails are pretty clean, but some are awful and then we have the horse and coyote poop on top of it! I might pick up other dogs poo bags…but I draw the line there. Good for you though. You mean you don’t pick up the horse poo? Ha, ha. Picture that – a real two-hander 🙂 I very rarely see poo that wasn’t picked up on hiking trails and at least put into a bag. Hikers seem to have gotten the message that it is bad for the environment (and hikers love the environment). I still see it pretty often in the City though. I just don’t understand it. Good for you. I will pick up dog poop in our neighborhood as well. But I haven’t yet tackled orphaned poop bags. One problem for us is that we pay per bag for garbage disposal. It’s $3.50 for a large bag. But it takes us about 2 months or more to generate that much trash. So I’m really hesitant to put stinky things in our home garbage. We freeze our stinky garbage (mostly fish bones and skin) until we have enough trash to put out. I’m not ready to freeze dog poop. I take a bag with me when I’m kayaking so I can scoop stuff out of the water. Luckily, because it’s been floating for a while, it’s not going to stink up my trash. In the woods, I’m more likely to dig a cat hole, 6-8 inches deep for disposing of waste on a walk in the woods. You need to be sure you’re a good distance from water. But it’s the recommended method for leave-no-trace camping. I can understand why you do it (I wouldn’t want dog poop in my freezer) but burying dog poop is not a good solution around here – at least on busy front-country trails (I do bury the poop on longer, overnight hikes). Our high-traffic trails can see up to 50 dogs a day, every day, so that would create quite a mess. If everyone stepped of the trail sufficiently to dig a hole to put pet waste in then the vegetation would all be trampled and the sides of trails would look like mini construction zones. We have seen the poop bags places too. I hope people are picking them up and not just leaving them around. Your idea to carry an extra ziplock is a good one. I hope so too but I have seen bags that have clearly been forgotten. Water droplets on a bag when it hasn’t rained in a few days is one sign (and it’s not humid either). Unfortunately the dogs and the responsible people always suffer for the sins of the few irresponsible ones, so, yes, I pick up other dog poop. I do it for the dogs and the good owners and myself so that we can continue to be allowed in areas. My thoughts exactly Jan. I don’t mind (ok, I do, but I will do it) so that I will continue to have the privileged to hike with Chester and Gretel. I will sometimes pick up other’s poop, but not normally. For some reason it makes me gag. I would however bring my pooper scooper and bucket with me up to our park and scoop in that manner. I am guilty of dropping the poop bag so I don’t have to carry it, but I always pick it up. I have actually gone back when I’ve forgotten to do it! I guess if the poop was in a bag, I might pick it up and carry it out. That is still picking up other people’s dog poop. I actually like the scooper pooper idea because it is more obvious and helps send the message to dog owners that it is the right thing to do…..and make it obvious that some people weren’t responsible so you had to do it for them. We frequently pick up other dogs’ poop when we are hiking. The Ziploc bags are a great idea! Some of the heavily used recreation areas here in CA are starting to require hikers to pack out their OWN poop now. That cat hole thing doesn’t work so well in areas where there is little rain, a lot of rocky ground and a bunch of hikers – most people only go far enough off the trail to get a little privacy, and the poop was piling up faster than it could decompose. Yeah, a few people have suggested that method in response to my post but that can be a problem too for reasons that you mentioned. Technically, Leave No Trace, means “no trace”…not even disturbed ground. That’s also not taking into account the people who don’t know how to bury their waste effectively or there not being any suitable terrain or soil to do so (like in your example). I don’t walk my dogs – they run in the backyard, running from the duck and goose. But I do scoop chicken, duck and goose poo. It’s all over my back patio every day, all day. I scoop it into a big bucket and toss it into the compost bin. Poop attracts flies and lots of them. Ew. I also have to empty the duck pool a couple times a week, since the poop makes it disgusting. We used to have ducks and chickens when I was a kid. I do remember what a mess they made. I seem to remember the ducks being worse. That angers us when we see full poop bags lying around, not only are they leaving poop, they are littering with the plastic bags. If it is a walk/hike without trash cans, Mom has been using a ziplock bag to seal in the stink since before even my older sister was born. It is not rocket science but lots of people are lazy. If you do forget to put the bag in the trash, we do agree that it can be nasty after a few days! I once forgot a bag of poo in my hubby’s car when I borrowed it. He found it a couple days later. Oopsie! Another great post about poop and water pollution – we only hope that everyone will pick up after their pups! You are, indeed the poop Queen! Our dogs do most of their business in the backyard, not on walks. If they happen to go while on a walk, then we of course pick it up. I hate to admit this, but no, we don’t pick up the dog poo that others have left behind… especially if it’s large… picking up my own dogs’ poo is one thing, but other dogs… it just grosses me out too much. I know, I know… that’s a weak excuse, but I just can’t help it. If we hiked on trails as beautiful as the ones that you guys hike… I don’t know… it might be different. Might. But my hubs would more likely be the one to pick up the orphaned poops, not me. Not because he cares more than I do, but because he is less grossed out by poopness than I am, lol. But I think it’s AWESOME that you care enough about the keeping the trails/environment healthy that you are willing to not only tote around Chester and Gretel’s poo, but also the poops that you happen to pick up along the way. Your legacy as reigning Poop Queen continues. Leaving it in your yard does not solve the bacteria problem. It multiplies in the soil and, depending on how high the water table is, can seep into the water table. It is still a problem but I am less concerned about it being in someone’s backyard than on the street or on hiking trails where it can easily wash into the water. No, no, no… I wasn’t meaning that we leave it in the backyard. Of course we pick it up from back there! Then it gets thrown away with our regular trash, which then goes to our trash-to-energy plant. I was just saying that we don’t have to pick it up while we’re walking that often, because they do most of it in the backyard. Sorry for the confusion. You have a trash-to-energy plant? That is awesome. I want one of those for Seattle! Sorry I made that assumption. I know many people who do not pick it up in their back yard because they don’t think it’s an issue there. I pick it up out of our yard. Even with two small dogs the back yard would be one big poop pit if I didn’t! ha, ha. That’s my biggest pet peeve, when people either don’t pick up their dog’s poop or they pick it up and then leave it. You’ve done the work of picking it up…and then you just leave it?! MAKES NO SENSE!!! Good for you. The longer I have owned a dog (aka the more experience I have), the more I pay attention to how non-dog-owners view us. I want to do what I can to not make a bad name for pet owners. I will admit to leaving a poo bag with the idea of picking it up on the way back; we nearly forgot it and I haven’t done it since. I see this all the time on our trails and at our dog park. I used to think it was okay, because maybe they have the biodegradable kind; I would see it and think nothing of it – and then someone told me that it’s not really biodegradable. I’m just glad that I never took up this habit. Even if it is biodegradable, a lot of those only break down into small plastic pieces. Even if it does break all of the way down you are back to square 1 – poop left on the ground. In that case, it was pointless to even pick it up. As I said, I used to leave mine to pick up on the way back. Once I couldn’t find it on the way back down. I suspect someone else picked it up for me but I vowed to never do it again because 1) I may have possibly lost it and the thought of leaving it in the environment chaps my hide and 2) If it was picked up, I bet the person thought I was a real jerk for “abandoning it”. Imagine if the person who picked it up wasn’t even a dog owner. I want to be a courteous dog owner and not make anyone mad (or at least leave that card for something less preventable. Ha, ha). Mostly where we walk there isn’t any other poop lying around, every now and then though my Mum has picked up what she thought was mine or Cosmo’s poop only to discover it wasn’t warm, and therefore isn’t ours, but she picks it up anyway! It would be nice if there were more places around to dispose of the bags, when we’re running it can be difficult for my Mum to run with multiple bags of poop whilst she tries to find a trash can! I know what you mean. I have had to run three miles before carrying a smelly, bouncy poop bag. Not fun but that is the way it goes sometimes right? It would be nice if there were more opportunities to dispose of it. I think the zipper bags are a great idea! I’m stuffing some in my back pack for sure. We live over the recharge zone for the aquifer that supplies our drinking water, so we are encouraged to pick up poop everywhere, even in our own yards. I’m not sure how, but supposedly it will wash down into the aquifer (not a nice thought about having poop in my drinking water, ugh!). I have to agree that it irritates me to see people let their dog poop and then walk away (unfortunately this happens every now and then at the dog shows where people should know better). Yes, if the water table is high, pet waste can contaminate the aquifer. It just doesn’t reside in the soil long enough to break everything down before hitting the ground water. I am surprised that people so into dogs, like show dog owners and handlers, are not more educated on the idea or responsible. I’m glad you posted about this. It is so annoying whether in the neighborhood or out in the wilderness. I agree, burying the dog waste is not a valid solution, not only due to tearing up the vegetation but also because that still leaves the bacteria in the poop potentially getting into a water source. If I am camping overnight in remote areas I will bury the dog poo along with my own number 1 or 2. Carrying it for days is not my thing 🙂 Some of these more remote areas do have an outhouse so sometimes I will put it in there. Definitely burying it on busy day-hike trails is not a solution. I only very rarely pick up other dogs’ poop. If I’m picking up Rita’s and there’s another pile left behind in the vicinity, I’ll get it at the same time. But it grosses me out (like others have said) so I don’t do it on a regular basis. As for folks leaving full bags behind, that happens all the time at the beach (which is silly cuz there are cans everywhere). I don’t pick those up because it’s hard to tell if it’s recent or not, and I try to give folks the benefit of the doubt that they’ll come back. The bags do eventually disappear (it’s not like the left behind piles just grow and grow) so I guess folks must be remembering to pick them up. Or someone’s picking them up anyway… The bigger problem at the beach is folks who don’t pick up at all! 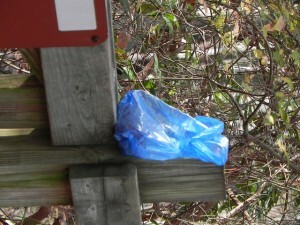 A few weeks ago we were walking on our local rail trail and we saw just that….used poop bags on the side of the trail. I said to my husband at the time that it really seemed to defeat the purpose! It never occurred to me to pick them up, but I didn’t have any extra bags with me to put them in anyway. A friend of mine was always looking for biodegradable poop bags, and I know why she was….because she thought that meant she could just throw them in the woods. Perhaps I should mention the zipper bag idea to her! There’s something wrong when a doggie owner expects someone else to pick up their dogs poop bag. It’s like asking some stranger to change your babies diaper. It’s just wrong. I don’t think it’s as much that they expect it to be picked up as it is they don’t think that leaving it is a big deal. The park we go to in winter is a partial loop/out and back trail so I have left my poop bag by the trail many times. LOL Although, if Daisy has her pack I will tie it to it. Since last winter though I have found the Fifth Paw. It connects right to your leash to hold poop bags and I’m planning on getting one of those this year. Have you heard of Pooya? We’re sending out free samples with our next shipment. It get’s rid of the smell–making it more “enjoyable” to carry the poo on the trail. We think it could create a dent in the problem of people leaving poo in bags behind to fester. I haven’t heard of it. Do you have a link? I couldn’t find it by searching Google. Sure thing. It’s http://www.pooyah.com/. Forgot the h 🙂 It’s a really cool product.